A central citizen of musical modernism, Henry Cowell drew musical influences from throughout the world and taught a legion of imaginative followers. When he was 16 he unveiled a piano piece that employed a device for which he is widely remembered: the tone cluster, in which adjacent notes are bundled into a self-standing sonority. In Cowell’s scores, these cloudy clusters often move from one to another much as notes in any melody would. We hear them in the billowing close-harmony of Synchrony, written in 1930 as a multimedia music-dance-and-lighting spectacular for Martha Graham (who, in the end, failed to complete her choreography). Cowell’s coeval Piano Concerto, doled out over two concerts in 1930, is also riddled with tone clusters; its middle movement even takes its title from them. Although their characteristic haze is a fingerprint of Cowell’s style, they are not all that these pieces are about. In the concerto, they are just one element the composer binds into an imposing sonic edifice rooted in the virtuosic piano concertos of the preceding century. Lou Harrison was inspired by Cowell even before becoming his pupil in 1935. His Concerto for Organ with Percussion Orchestra owes its orchestration to the simultaneous arrival of separate requests for new pieces—one for organ, one for percussion ensemble. Harrison’s distinctive sound, derived from Asian percussion styles and exotic scales, here grows positively dazzling in both instrumental color and, at places, volume. Few works in his fertile output surpass this concerto in exhilarating melodies (with telling use of Cowell style clusters) and scintillating rhythms. 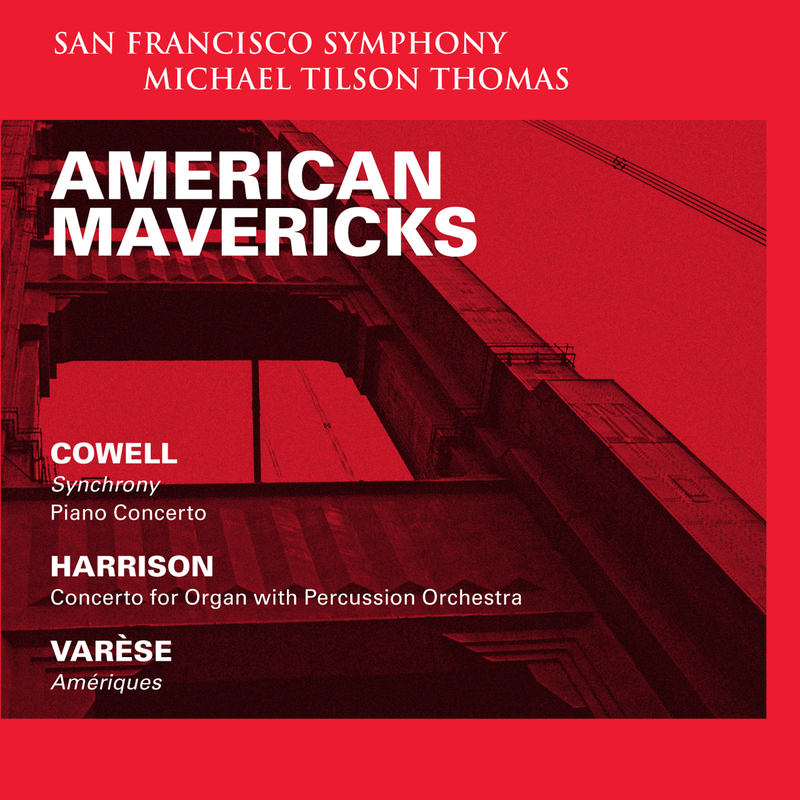 Recorded live at Davies Symphony Hall — a venue of the San Francisco War Memorial and Performing Arts Center, City and County of San Francisco. Synchrony recorded December 8–10, 2010. Piano Concerto, Concerto for Organ with Percussion Orchestra, and Amériques recorded March 3-17, 2012.